Write a Java program to calculate total surface area of a cuboid. Here we wrote the code in three different ways with online execution tool , examples. The following program has been divided into three formats as shown in the table of contents. Check out :). If you need any more information regarding sample programs, then do contact us or leave a comment we are glad to help you out. Before we show you example Java program to calculate a total surface area of a cuboid , you can check out the math formula and definition about an entire surface area of a cuboid. In case if you know the basics then skip this tutorial and move on to the program code. Def : Total surface area of the cuboid ? 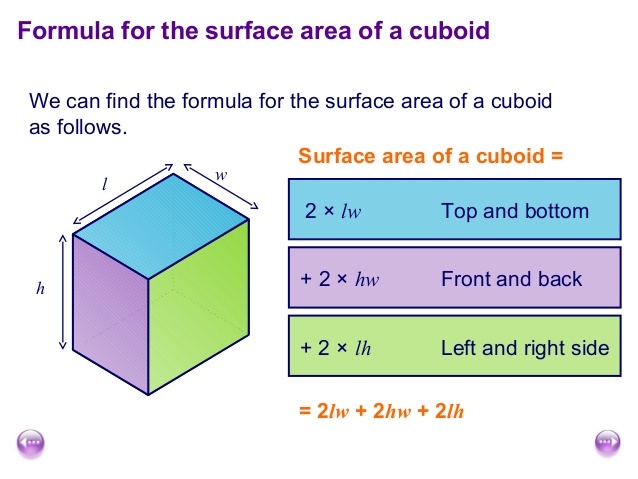 The total surface area of a cuboid is the sum of areas of its six faces. What is the formula to find the total surface area? Did you get an idea, right ? Here is the program by using above method.